Just before diplomats met in Montreal last December to discuss their countries carbon emissions under the Kyoto Protocol (the international agreement between more than 150 countries to cut back on greenhouse gases by 2012), researchers announced that they had created metal-based sponges that have exceptionally high capacity for storing carbon dioxide. This nanotechnology is one of many new solutions in the search to find a quick fix for storing human-emitted carbon-based gases that could have a warming effect on the planet when released to the atmosphere. 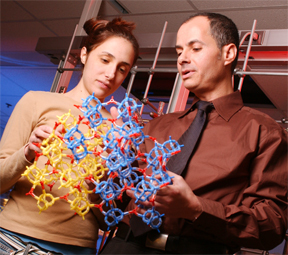 Omar Yaghi and his co-workers recently created a honeycombed structure made of metal and organic molecules, with pores large enough to hold carbon dioxide. Image courtesy of University of Michigan, Ann Arbor. The metal sponge heralded last year came from researchers at the University of Michigan in Ann Arbor and is one of many MOFs, or metal-organic framework compounds. The dense honeycomb structures of metal and organic molecules trap carbon dioxide in their pore spaces and have the potential to hold nine times as much carbon dioxide as an empty canister under similar pressure and temperature conditions, their inventors say. The amount of carbon dioxide these technologies could hold is miniscule, however, compared to the many millions of tons of the gas that eventually may have to be stored, Friedmann says, and many are too expensive. Other geological techniques, including creating carbonate brine by, for example, injecting carbon dioxide emissions from power plants into slurries of limestone and water, remain unproven. A fast geological solution, Friedmann says, is to pump carbon dioxide into reservoirs in rock formations that are capped by a natural impervious layer. The more we study geological sequestration, the better it looks, he says, despite ongoing political and technical challenges. So far, oil companies have been the primary practitioners of such geologic sequestration, using enhanced recovery techniques  pumping gas into the ground to increase oil output  in land-based experiments from Canada to Algeria (see Geotimes, February and March 2005). The final goal is to get more oil, but in the process, [injection] will leave behind a significant amount of carbon dioxide and the reservoir will trap it, says Vello Kuuskraa, an engineer and president of Advanced Resources International, in Arlington, Va. A second potential injection setting is coal seams, to displace and capture the methane thats trapped in coal, he says, something with which his company has had some experimental success in the San Juan Basin in Colorado, injecting 4 billion cubic feet of carbon dioxide over six years. Currently, companies working with enhanced-recovery techniques use existing wells and other infrastructure, which makes the practice more cost-effective than most new technologies. They can buy carbon dioxide captured from natural sources as well as from industrial sites, which creates a market for carbon dioxide emissions, Kuuskraa says. Such initial transactions will help in assessing the value of future carbon credits as we dont have a market price for it yet  which in some ways, is a stumbling point for international and national efforts to regulate the greenhouse gas. Although some test cases are in the works, regulations for sequestration applications are also lacking worldwide. These rules eventually should include how long the gas must remain underground or how to manage and monitor these sites over the long term, says Elizabeth Wilson, a policy researcher at the University of Minnesota in St. Paul. Without such rules, the applications are not yet ready for providing carbon credits under Kyoto or other regulations. Under the U.S. Environmental Protection Agency, a regulatory structure that could serve useful for carbon sequestration already exists for storing waste water in underground reservoirs, but Wilson says that the rules are not ready for application. So far, Florida has served as a case study, where trouble with fluid migration and escape has stymied Floridas regulatory agencies, Wilson says. To create valuable carbon credits, agencies will have to be able to handle those issues. The first story in this three-part series addressed some of the science that complicates carbon credits. Read next months Geotimes for the third installation, on policy challenges for carbon credits.